The hard work of prepping the site is only now a memory. All the sore muscles from bouncing around on the tractor have returned to normal. 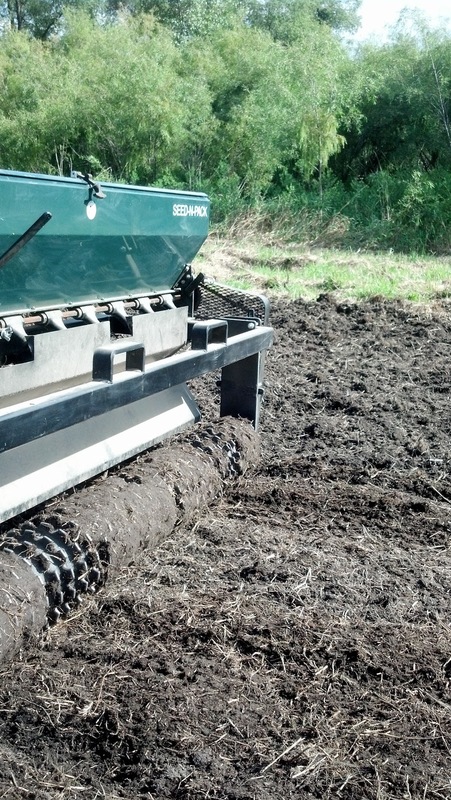 The photo shows a piece of equipment called a Seed-N-Pack. It is a drop seeder that works on disked seedbeds. The hopper on the top, with the logo, can be filled with seed. As you drive along seed would drop out from the hopper and be spread. However, I don't plan on filling the hopper with seed. I want to use it for the bottom part, the cultipacker. In the picture you might be able to notice circular rollers with grooves. That's the cultipacker and it works great to even out seedbeds. Notice the differences of the soil surface from using the cultipacker in the photo. After using the cultipacker I simply used a hand seeder to broadcast the seed. I used half the seed bag while walking back and forth the long way. And then the other half of the bag walking across the food plot the short way. Doing this decrease the chance of missing an area. Using the cultipacker for a few more passes over the broadcasted seed and the plot was done. This last step helps the seed to get good soil contact, which in turn helps germination happen. 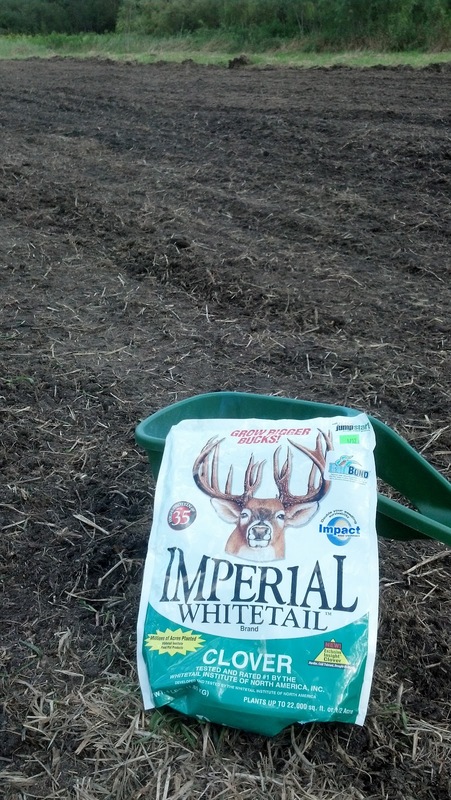 The food plot size is 80 feet long and 270 feet, approximately one half acre. 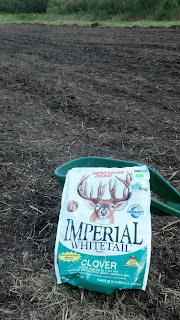 We planted Whitetail Institute's Imperial Whitetail Clover. Clover is a perennial so if this comes up properly we shouldn't have to do anything with it for next five years. It also provides the deer some variety from the nearby row crops of corn and soybeans.